In an interview to be published in this week's of NSA whistleblower Edward Snowden said the US National Security Agency works closely with Germany and other Western states. The interview was conducted by US cryptography expert Jacob Appelbaum and documentary filmmaker Laura Poitras using encrypted emails shortly before Snowden became known globally for his whistleblowing. 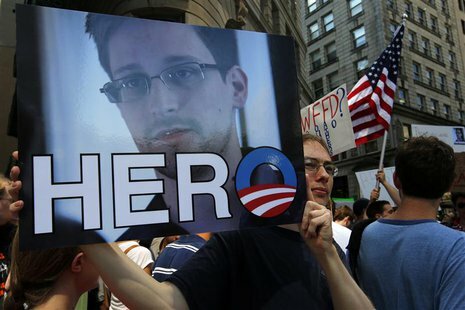 Snowden said an NSA department known as the Foreign Affairs Directorate coordinated work with foreign secret services. NSA provides analysis tools for data passing through Germany from regions such as the Middle East. "The partnerships are organized so that authorities in other countries can 'insulate their political leaders from the backlash' if it becomes public 'how grievously they're violating global privacy,' he said. Germans are particularly sensitive about eavesdropping because of the intrusive surveillance in the communist German Democratic Republic (GDR) and during the Nazi era. The US government has revoked the passport of Snowden, a former NSA contractor who is seeking to evade US justice for leaking details about a vast US electronic surveillance programme to collect phone and Internet data. He has been stranded at a Moscow airport for two weeks but three Latin American countries have now offered him asylum.